I have swapped my normal pellet recently from Elipse (hinders) to one which has much lower oil content. SIZE: 12mm, PROTEIN: 41%, OIL: 24%, ASH: 13%. You can tell the oil content is much lower than the Elipes just by the colour and the non residue in the bag and they are also a much lighter shade than the Elipse pellet and slightly reddish. I have read lots of articles and spoken to many people and the consensus is high oil is a no no. The fish basically take a few pellets then lay up full and are no good for a day or two. Just wondered what you chaps think? 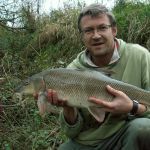 Hi Jedd, Don't know the answer to your question as I'm new to barbel fishing, but I was chatting to a bloke in veals who said that barbel can't digest the oily pellets properly in the colder months. Maybe this is why they don't get hungry for a while afterwards, especially if someone has chucked in a load of loose feed as well! I think i remember reading somewhere that the higher oil content in the pellet has a detrimental effect on the fishes livers.................... mind you i could have misread that. Waiting for my next bite! That's still a high oil content at 24%. I forget what the original elips pellets were but they weren't that far off. Most pellets are developed for commercial fish farming and have a balance of nutrients to sustain life and growth - trout and salmon pellets formulated for trout and salmon feeding and halibuts for halibut feeding. The eliptical shaped pellet was designed to fall through the water more slowly in an attempt to decrease wastage caused by dropping out of the cages uneaten. The red colouration that is found in trout and salmon pellets are substances designed to impart a pink tinge to the flesh - that occurs naturally in wild fish because of their diet, in cages the presence of naturally occuring substances are non existent. Your average buyer of farmed fish likes to see a similar appearance in flesh of 'farmed' and 'wild'. Halibut having a white/greyish flesh these colouring agents aren't required so much. It just so happens that according to some opinions these colouring substances are also attractors in their own right, as well as functioning as antioxidants. The antioxidant bit may account for some peoples observations that salmon/trout pellets tend to have a longer storage life that corresponding halibuts. OK, nowt really wrong with the pellet used in moderation for barbel - as at most 'normal' feeding water temperatures they are effective as baits. However, by applying a bit of thought you can increase your chances and maybe make a better choice. The main problem is US - we tend to chuck a few in, then again and again when the fish just ain't feeding. Then we create problems for us as the angler and problems for the fish. When the fish decide to feed there's some already lying around. General result poor catch returns. So the moral of the story is - regulate your freebies (that applies to any bait - not just pellets) and maybe catch more. I was in a swim hidden from view and watched as anglers visited a swim slightly downstream and chucked in a handful of bait each time. This happened over the next 6 hours with four different anglers and the water temp was around 45 degrees - not overly cold but I reckon that the fish when they decided to come out and have a feed had enough for about a week or more.